Do not adjust your monitors. While this view of Pluto looks like it’s all screwed up, in fact it’s an image from New Horizons that brings out the subtle variations in color on its surface. The image uses a technique that NASA calls principal component analysis. 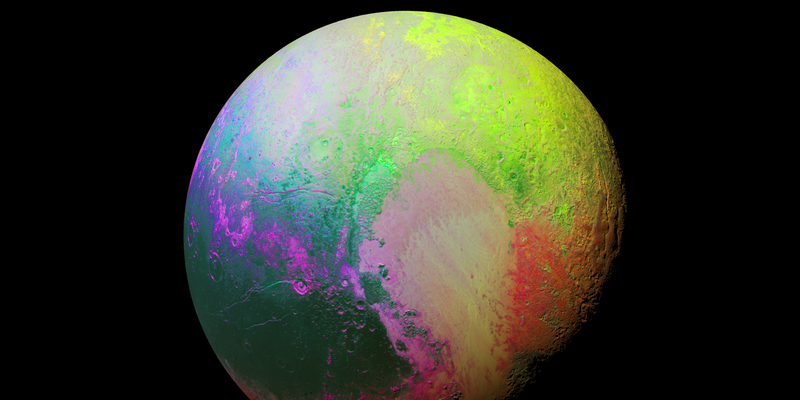 It’s designed to “highlight the many subtle color differences between Pluto’s distinct regions.” In other words, it brings out the main color components across the surface, to show how they vary. So while the image is false color in the truest sense of the words, the image does at least show how the main color of Pluto varies. The image was captured on July 14th, but presented at the meeting of the American Astronomical Society on November 9th.